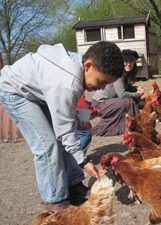 Farm Tours are a great way to get to know the farm and its animals, fields, woodland and orchard. The tour is delivered by an experienced member of staff. Farm tours are tailored to your class's needs and interests, and can include focusing on where food comes from, animal care and the natural world. We will meet all of the animals and will feed and handle some of them.